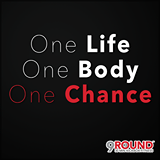 9Round Kickbox Fitness - Get Involved. Make Friends. Enjoy Motherhood. We offer a 30 minute, full body circuit training/kickboxing workout with no class times. A new workout starts every 3 minutes. There is always a trainer present to demonstrate the exercises and motive people through the whole workout. We modify the exercises depending on the physical needs of each member. The workout is fun, high energy, and changes everyday! MOD Moms Discount: 10% off all memberships!